Subscriber magnet group promotions involve multiple authors giving away their subscriber magnet books for free on one convenient page, and these are a great way to reach even more readers. Plus joining or creating a promotion is FREE. Normally, the group creator ask that every author in the group share the group link on social media and with their newsletter subscribers. Click here to see a current group (this promotion ends on Feb 28th). 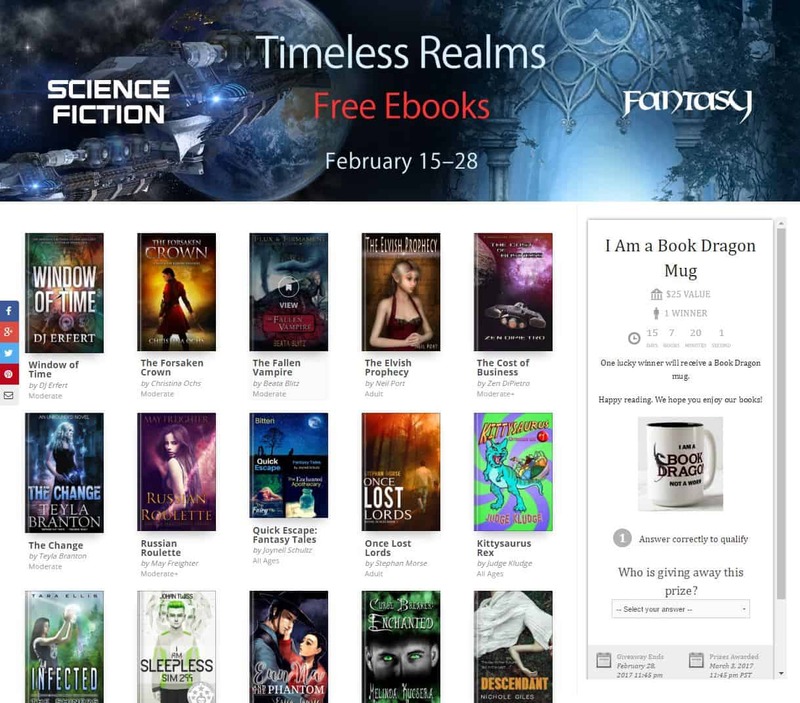 These promotions can be hosted directly on Book Cave, using the subscriber magnet feature. 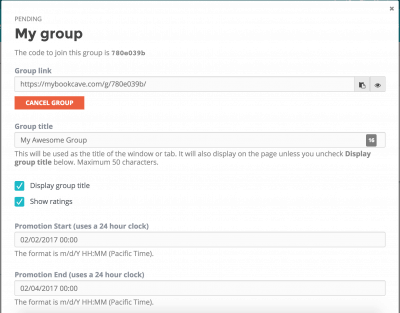 If you're having trouble joining or creating a group on Book Cave, check out this tutorial for an easy walkthrough. You first need to set up your book as a subscriber magnet. Check out our author Facebook page to see what promotions are in the planning stages, so you know what book to make into a subscriber magnet. If you’re not sure how to set up your book as a subscriber magnet, use our tutorial here. Go back to Book Cave and click on My Magnets under the Account menu option. You must be logged in for this menu item to appear. 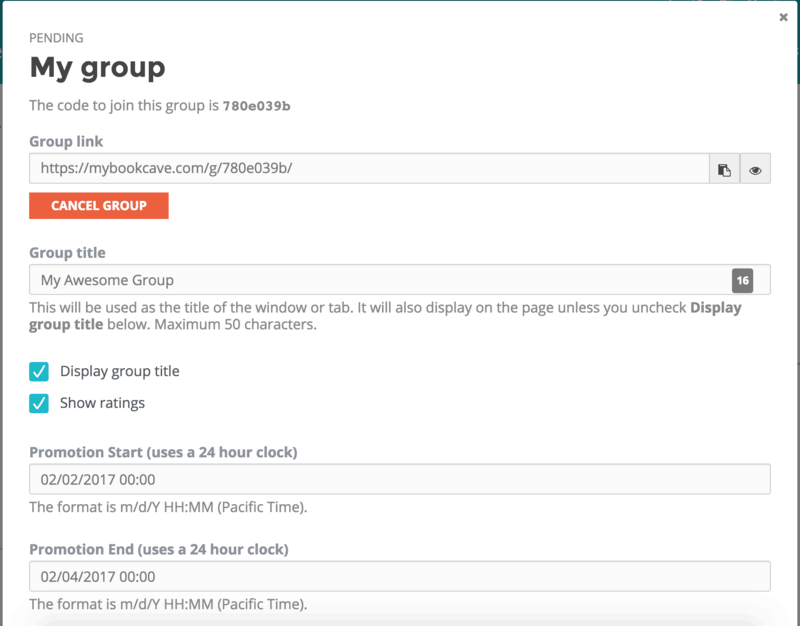 From here, find the book you want to use and click on the Join a Group icon. In the popup that appears, put in the group code you copied from the Google Doc. You’ve now successfully joined the promotion. It’s as easy as that! Creating a group promotion takes a few more steps. Let's take a look! Under the Account menu item, click on My Group Magnets. Click on the Current Magnet Groups options, then, on the bottom right of this page, click Create group. On the popup, fill out the group page information, including the group name, the start and ending dates of the promotion, the banner image (optional) and the share image (please refer to the image size specifications under the upload button, to ensure your image looks good), and any promotion text (like a greeting to readers or a description of the promotion—this is optional). When you’re finished filling out the form, click the Update button at the bottom. You can edit these details by clicking on the group title link. If you run into an issue with the promotion, please email us and we'll work it out. 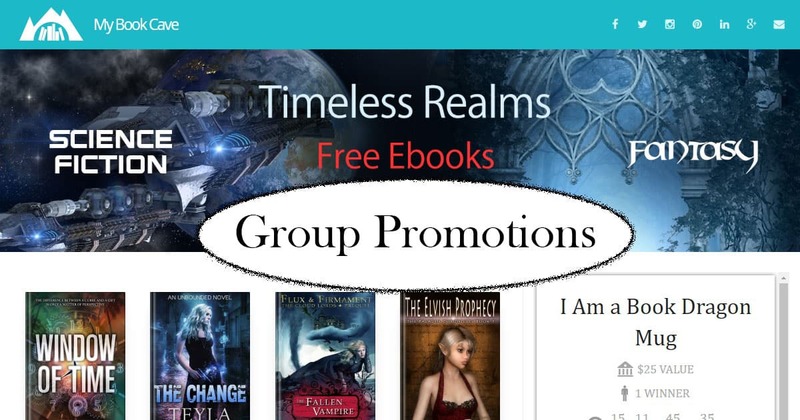 On this page, you can also see the group code that you’ll put on your Google form or otherwise send to other authors who want to be in your promotion. You will also have the link to preview the group promotion. You’ll now need to create a Google form that includes the dates and genre requirements of your promo (if any). The purpose of this form is to give you the information you need to determine if another author’s book meets the criteria for your group promotion. If, for example, you only want books in the mystery genre, and someone submits a historical romance, then you wouldn't want that book to be part of your promotion. Or, perhaps someone enters who doesn’t have a newsletter list and your requirement is that every author sends out the giveaway to their newsletter (we recommend this for best results). You wouldn't want that author to join, and you would need to send them a polite email explaining why. Your Google form also needs to ask for their email address and the link to their subscriber magnet on Book Cave (make these fields required). That way you can make sure they have their subscriber magnet ready and you can match the information with the author/book to see if it fits your needs. Also make sure the author commits to sharing the group promo on social media and in their newsletter. You may want to ask the sub-genre of their book and how many newsletter subscribers they have. You can check out examples of current Google forms for group promotions here: spicy romance and Christian reads. To create a Google form, go to google.com/forms and click the + button on the top left to create a new form. If you’re not familiar with Google forms, check out Google’s help guide here. Don't forget to include the group code on your Google form so authors can start joining your promo! Don't worry, you get last say on whether they can join, and it will save you time if you let them start joining as soon as possible. Here is where the joining code can be found, as mentioned above, under the My Group Magnets menu item (under Account). Next, you’ll want to post about the promotion on our Group Promotions Facebook page. Include the end and starting dates of the promotion, the genre you’re looking for, and a link to the Google form. Periodically check the answers you’ve received to your Google form to see if submitted answers match your criteria (they usually will). As authors put in the code for the group promotion (that you either posted on the Google Doc, emailed them, or posted elsewhere), you will see their requests to join appear on your dashboard underneath the magnet group information. You can click on the links to each book before you approve them to double-check that it fits the criteria for your promotion. As you approve the books, their books will show up on the group page. Authors will be sent an email, notifying them that they were accepted. You can add or delete authors at any time, and authors who join your promotion will not be able to withdraw while the promotion is going unless you remove them. That's it. All finished. Easy. And it's always free to set up a group promotion. But wait, that's not all—spice it up with a prize! 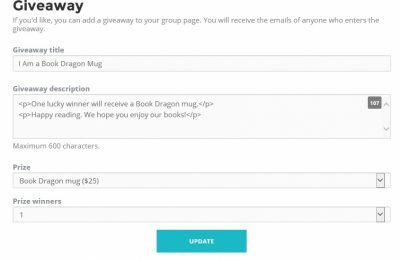 A great way (but totally optional) to encourage readers to peruse your group promotion page is by offering them a chance to enter a prize giveaway. 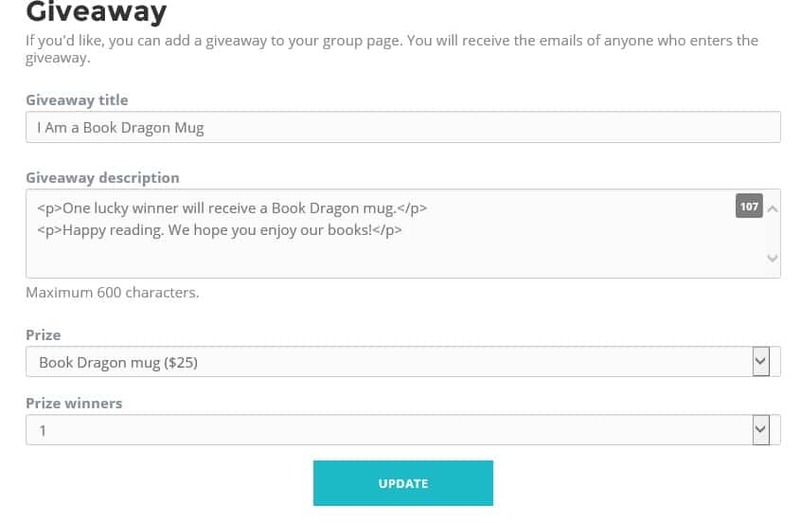 To add a prize giveaway open the group's edit box by clicking the group promotion title and scroll to the bottom of the form. Fill up the giveaway title and description, and select your prize and number of winners. Don't let the html tags below scare you (<p></p>). Those show up after saving the first time and are added automatically, so just ignore them! We will set up the giveaway for you, select and notify the winners, purchase and ship the prizes, and email the list of entrants to the group promotion organizer. Entering the giveaway information will generate an invoice for the total cost of the prize(s) plus a small fee for administering the giveaway. You will be able to change the prize and/or winners, or even remove the giveaway up until the invoice is paid. After the invoice is paid, the form will no longer allow you to change the prize or the number of winners. If your group promotion goes live before the invoice is paid, the giveaway will of course not show on the page. For an example of a group promotion that includes a prize drawing giveaway, click here. Who pays for the giveaway prizes? The invoice will be assigned to the group promotion organizer, and it is your responsibility to pay for the invoice. You can choose to pay for it yourself or to collect money from the other authors in the group. As the organizer, you can choose an official "sponsor" for the prize and readers will have the option to sign up for that newsletter when they join the giveaway. This is a definite perk of being the group organizer! It's very easy to create a group promotion. Why don't you grab a few of your author friends and start one of your own today? If you have any questions about how to join or create a group promotion, let us know! If you'd like to learn more about what Book Cave can do for you, please enter your email below and click the "Learn More" button. Way too confusing for this disabled senior citizen to fill out!